Let's step back and talk about the Birds of Prey. The original incarnation of the Birds of Prey, in the post-Crisis/pre-Flashpoint continuity, was in a large part based on history. Barbara "Oracle" Gordon, Dinah "Black Canary" Laurel Lance, and (eventually) Helena "Huntress" Bertinelli were all characters with long histories in the DC Universe. Barbara had been Batgirl, was shot and paralyzed, resurfaced as Oracle, and had relationships with characters like Batman and Nightwing. Dinah was the daughter of a superhero from the 1940s, a former member of the Justice League, and had been involved in a long-term relationship with Oliver "Green Arrow" Queen that had recently ended. 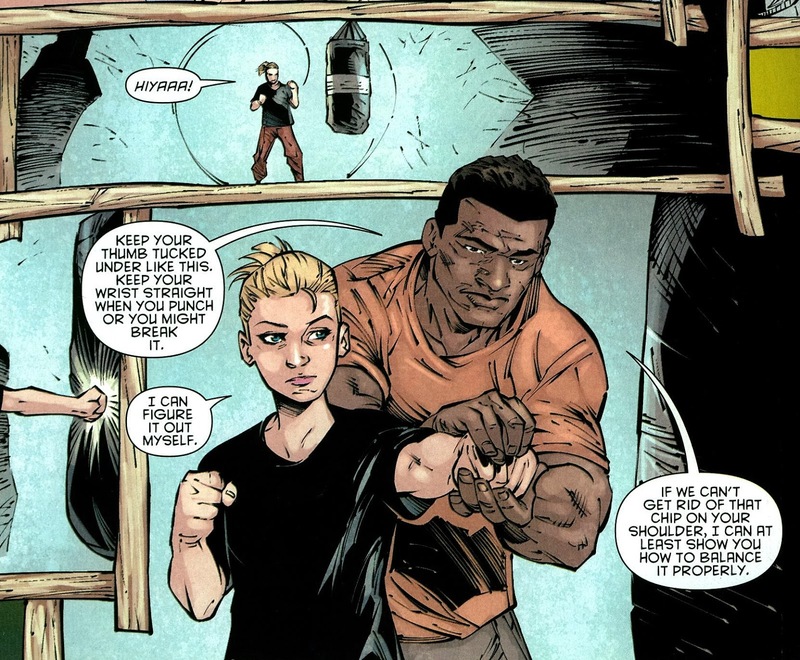 Helena was a more recent character, but had still built up a history as a character on the fringes of the Batman world, which included a brief sexual encounter with Nightwing. The team first came into existence in Black Canary/Oracle: Birds of Prey #1, from 1996, but Black Canary first met Oracle and Huntress in Black Canary vol. 2 #10, from 1993. These characters had history with each other, which shaped their personalities, interactions, and stories. The post-Flashpoint version of the team has none of this. Now, I don't deny that a reboot may have been necessary, but it definitely impacted the Birds of Prey negatively. Over thirty issues of their adventures later, and I don't have a feel for these characters beyond single lines: Dinah is mopey and lacks confidence, Batgirl is similarly always on the edge of a breakdown, Strix is silent, and Condor is just kind of there. Why do these characters hang out with each other? What's their purpose? I don't have a feeling for why Dinah and Barbara might be friends in this new universe, for example. The lack of history is part of the problem, but not all of it: thirty issues is plenty of time to have built up a new history, but this book hasn't done that. At least, not a compelling one. Birds of Prey is a book without a reason to exist, as far as I can tell, a grim, dull action comic book about dreary one-note characters that occasionally has to tie in with storylines going on in Batman or Detective Comics. A man so important to Dinah, she will never allude to him before or since. His influence is such that when she gets to be a sensei herself and run her own dojo, she doesn't give a crap when it burns down. Marx also sets up a new status quo and mission for the Birds. Throughout this volume, they're based on a giant barge in Gotham harbor owned by "Mother Eve," an ancient immortal. This transition is not handled very well. Mother Eve tests the Birds to make sure they're good, in both this volume and the previous one-- but why do they trust her. She's fighting Ra's al Ghul (who everyone calls "al Ghul" like it's his surname), who is evil, but that doesn't make her good! Indeed, an ancient immortal who uses her descendants in a millennia-long war but refuses to share the secrets of her immortality seems a little morally suspect to me, but the Birds accept her with nary a thought and essentially become soldiers in her army, giving up their autonomy. So this book has a stable premise now, but it's one I don't care for: what is Mother Eve trying to achieve other than her own survival? It makes our main characters someone else's tools in a very unappealing way. It doesn't help that Eve regresses to the age of a child, but evidently none of the eleven artists who worked on this volume have any idea what children look like. Aside from that, there's more tie-ins with storylines in other books ("Zero Year," "Gothtopia," and "Future's End" all pull the narrative in various directions) and more handwringing over uninteresting melodrama. Will Kurt Lance ever remember who Dinah is? I still don't care about this guy. This book establishes that he never loved Dinah much anyway and only got married because he thought they were going on a suicide mission, which 1) would be a more effective rug-pulling moment if we'd actually seen anything substantive about their relationship in Team 7, and 2) I'm pretty sure doesn't actually fit with the timing of their marriage in Team 7. I could be wrong though, because most of Team 7 failed to imprint in my memory. Also the book tries to explain away how Kurt could be killed in battle in Team 7 but Dinah was wanted for murder in the Swierczynski-penned Birds of Prey stories, and it very nearly convinces with its retcon, though if the entire black-ops community was after Dinah because she "destroyed an island" and was "a new power, out of control, too dangerous to be running around loose," as Amanda Waller claims, it seems a little odd 1) they took around three or five years ago to come after her, 2) everyone said they were after her for murdering Kurt, and 3) they just gave up after a couple tries and let her run amok with this terrible power anyway. Also Condor continues to be a focal character; I liked him better when he was a somewhat dopey guy I wasn't supposed to take seriously, and not a dramatic lead who is supposedly in love with Dinah but fantasizes about killing her ex-husband. 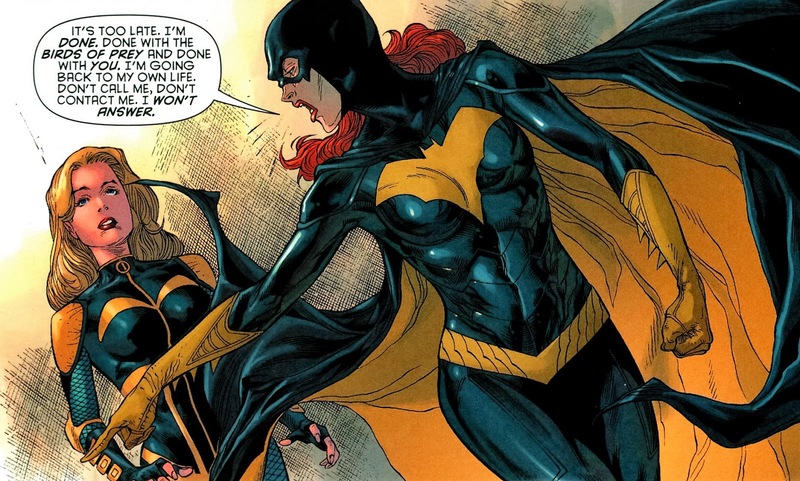 How do we get from this to Canary crashing on Barbara's couch in Batgirl of Burnside, anyway? All the characters go off in their separate ways. Barbara and Dinah, I know, get retooled as better characters in the Burnside-era Batgirl comic. It's difficult for me to imagine caring about what happens to the rest of the characters in this book. This summer saw the beginning of a new take on Birds of Prey, Batgirl and the Birds of Prey. From what I know of its premise, I have some reservations, but it has to be better than this. Next Week: I've finished up catching on various series, so it's time to get back to Project Crisis! This round, it's the story responsible for all my moaning here: Flashpoint!